The Milwaukee® 152mm (6") Diagonal Cutting Pliers feature Iron Carbide Edge hardened cutting edges for more Cuts and a tapered nose with flush cutting blades, which cut all the way to the tip. The pliers’ head features integrated reaming ridges (patent pending) for removing burrs from the inside of smooth pipe. 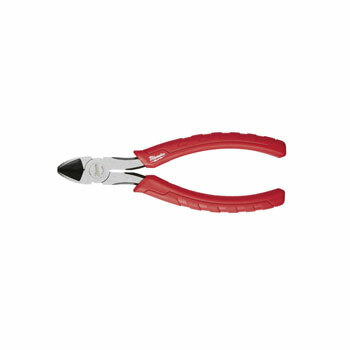 For added functionality, the Milwaukee® 152mm (6”) Diagonal Cutting Pliers features an integrated fish tape puller. Milwaukee® pliers feature over-molded comfort grips, which will not peel under jobsite conditions. All Milwaukee® pliers are forged for strength and feature rust protection for long life.